Outreach with the ONE Campaign and (RED) on the 2007 Dave Matthews Band Campaign. (RED) table and new sign! Rockstar volunteer Alyssa talks to DMB fans! DMB fan signing our banner! DMB fans sign the banner. 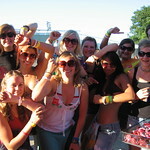 DMB fans join ONE and (RED) in Milwaukee! Our new (RED) set up! Back of our new volunteers shirts! (RED) and ONE volunteers represent! Our volunteer team head off to work..
Young DMB fans show their support! DMB fan signs up with ONE and (RED)! Sunday night volunteer crew, with Sammi showing off the back of her shirt! DMB fans showing us their support! Their dog ate their old wristbands. Best story of the night!